The complete Modulus demo D64 diskette image file, containing all programs in original order. For use with Commodore 64 emulators and transfer to diskettes through OpenCBM. Modulus test tool program with transfer through the R.F. Command Keyboard. Controlling the Base through the keyboard of a computer. Controlling the Base through a joystick connected to a computer. Modulus test tool program with transfer through the cable-link. Changing the voice settings of the voice slice. Programming the left arm of Moddy to run in a sequence. Programming the right arm of Moddy to run in a sequence. Demonstrating the various sensor capabilities of the home-security slice. A welcoming message, triggered by movement. Calculating drive parameters for the Base. Demonstrating the voice capabilities of the voice slice. A program for moving Moddy through the keyboard of a computer. 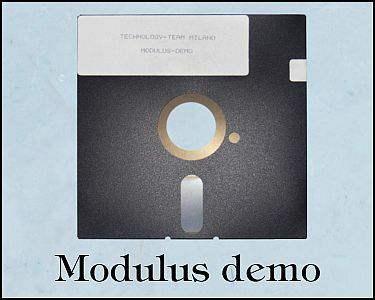 The Modulus demo diskette contains useful programs for further expanding the use of the robots, and can guide you to making your own programs to control their functions. Press the program name to download it as a PRG file that can run in a Commodore 64 emulator or be copied to a diskette through OpenCBM.